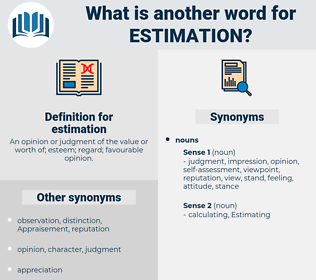 What is another word for estimation? 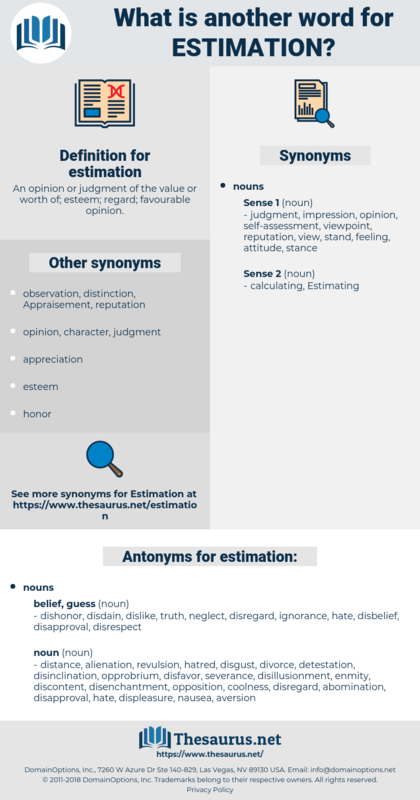 An opinion or judgment of the value or worth of; esteem; regard; favourable opinion. data, opinion, approximation, view, discretion, evaluation, forecasting, miscalculation, expectation, identification. projection, esteem, prediction, judgement, est, Estimating, reckoning. dishonor, disdain, dislike, truth, neglect, disregard, ignorance, hate, disbelief, disapproval, disrespect. disenchantment, condemnation, opposition, disgruntlement, estrangement, discontent, repugnance, dissatisfaction, coolness, animosity, antipathy, enmity, disfavor, deprecation, revulsion, hatred, aversion, displeasure, distance, detestation, divorce, scorn, indignation, separation, distaste, indifference, opprobrium, nausea, disinclination, disgust, disappointment, repulsion, disillusionment, unhappiness, abomination, loathing, severance, alienation. How long it would take for the boat crew to land, inform their fellow head - hunters of what they had seen, and fetch the entire company to capture him, here in the chamber, was not a matter for easy estimation. You are higher at this moment in my estimation, in your own, and that of every honest man, than you ever were before.